Blend in egg, peanut butter, baking soda, salt and vanilla. Add flour and oatmeal. Press mixture into 9 x 13-inch pan. Bake at 350 degrees for 20 to 30 minutes until golden brown. Remove from oven. Sprinkle with chocolate chips. Wait ten minutes and spread chocolate chips into a frosting. 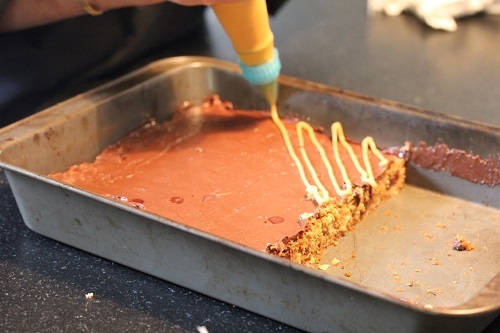 Spread in lines on top of chocolate frosting. Cool and cut into twenty squares.